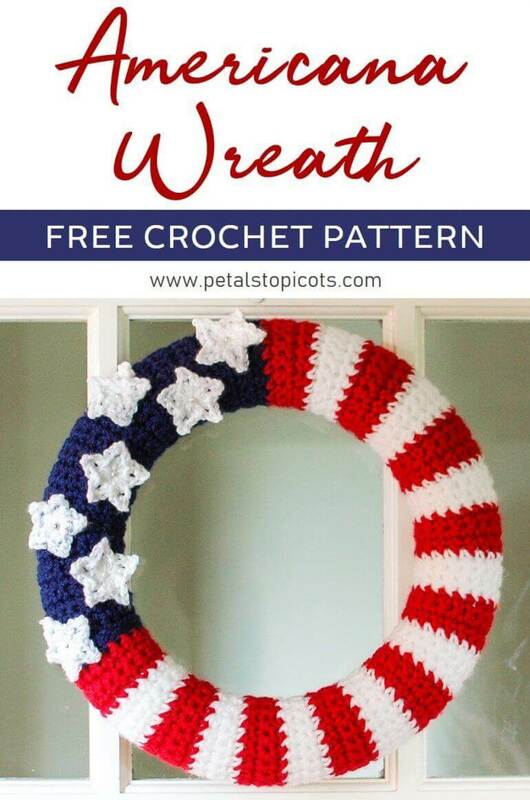 Stitch up this American Flag Wreath Crochet Pattern to celebrate the 4th of July or to add some flare to your Americana decor! With blue, Ch 19 (or the length you need to fit around the tube of the wreath). Row 1: 1 sc in 2nd ch from hook and each ch across, turn — 18 sts. Rows 36–39: Join red, ch 1 (does not count as st), 1 sc in each st across, turn — 18 sts. Rows 40–43: Join white, ch 1 (does not count as st), 1 sc in each st across, turn — 18 sts. Rep Rows 36-43 8 more times. Rows 108-111: Join red, ch 1 (does not count as st), 1 sc in each st across, turn — 18 sts. Row 112: Join blue, ch 1 (does not count as st), 1 sc in each st across, turn — 18 sts. Round 1: Ch 1, work *[1 sc, 1dc, ch 2, 1 sc in 2nd ch from hook, 1 dc] in ring, rep from * 4 more times, join. To assemble your wreath, fold strip in half and Sl st Rows 1 and 112 together to form a ring. Wrap fabric around wreath form and sew edges together to enclose around wreath. Arrange stars on blue portion of wreath as desired. Stitch into place or use pearl pins to fasten to wreath. Click here for more free 4th of July patterns. I love this and can’t wit to make one. Thank you so much for sharing. Great, We have featured 2 of your 4th July patterns on our website. Lovely patterns 🙂 The American Flag Wreath and Star Spangled Banner Bunting. Love the pattern. . .I’ve made 3 or 4. . . The star pattern can be modified to make a triangle border. . . Thanks for the pattern. . . I have now made 2 wreaths and used the star pattern for a corner to corner American flag. . . Really appreciate it!! Love this! I’m going to make this right now — already have all the colors! Thanks for sharing!!! I just made this today for Memorial Day. It turned out great. Thanks for publishing the pattern! May have to make this one. My current crocheted wreath has seen so much use the red is turning orange! Hi, I was wondering if you allow items to be sold from this pattern? Hi Rosanna 🙂 Yes, you may absolutely sell any items you make from my patterns. Thanks so much for asking and good luck! How many chains do you start your magic ring with for the stars? The pattern doesn’t say and I’m at that step. The tutorial says to use the number of chains per pattern but I don’t see it listed here. Thanks! Hi Denise 🙂 You will be working all the stitches from Round 1 in the magic ring, starting with the ch 1 indicated at the beginning of the round. Keep in mind the magic ring is an alternate to making a beginning chain and the forming a loop. If you would rather, you can do that though … just chain about 4 chains and join and then continue the pattern at Round 1. Hope that helps! Thanks, I was able to figure it out after I sat down with my hook and yarn. I’m not used to have it written out that way. Thanks again! I just found the site and just love all the different patterns you have on it. 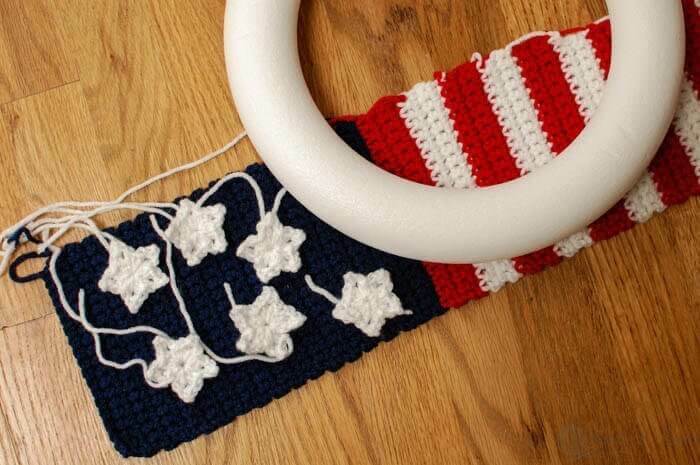 I am going to do flag wreath I like to do something different on holidays. Thank you for the site and hope to use allot of patterns. Thanks for publishing this! I have seen this pattern a few times and thought it may be too complicated for a somewhat- beginner but it was very easy to understand and super quick to work up! Came out great and I have received may compliments on it! Thanks again! thank you so much for the pattern I am making this! Thanks again for sharing your patterns! Awesome!! Thanks so much, Tamara! Love the pattern! Bought a 12 in form from the store. Got home started crocheting. Checked to see if it would go around the form. Perfect! Continued. Found I had to add more rows to fit around? When I went to stitch it together I could t get it all around. I had to stretch it. In some spots it doesn’t go all the way together. It’s ok though. No one will see the back. I’m starting the stars now. It says start with magic ring. The video says chain the amount the pattern calls for. But I don’t see an amount! I know the 4th has come and gone but I want to make this for a friend whose husband was deployed. Thanks. I’ve never used magic ring before. Hi Annie 🙂 Glad the base of the wreath worked out for you! To do the stars, just ch 1 after the magic ring and start the stitches are noted in the pattern. Hope that helps! 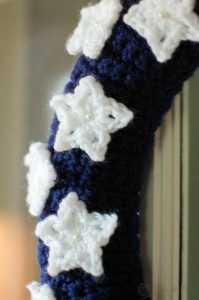 If I may say so there are prettier 2′ star patterns on the internet that have more defined points, just google 2″ crocheted star pattern. I used red heart yarn and followed the pattern exactly and had to add 7 more striped rows for it to go around a 12′ form. I also made it 5 single crochets wider so it wouldnt be so tight to the form. Just google it to find the instructions on how to do a magic ring. You can google anything that you don’t know how to do. I got it done in time for the week before the Fourth! Thank you for making the holiday so extra adorably American! Hi Mrs Kara !…you did a great job,I love this project….wonderful idea for next week.Wow…so beautiful. I love the 4th of July Wreath, but it took 25 pages of precious paper to get to it. What a waste. Hi Beverly 🙂 Glad you like the pattern. You should be able to choose the page range to print on your printer. That is what I usually do when printing off the internet. Hope that helps. There’s also a site called Print Friendly (i have no connection to them, just heard about the site through friends). It has made printing crochet patterns so much easier. You can either enter the URL of the page – or use their little bookmarklet – and it will give you options, such as Remove Images and Delete This. You can delete the unnecessary bits. Also, when printing patterns, it’s important to go to the actual page of the post rather than the main blog link, otherwise the print button thinks you want everything, not just what you see on screen. Easiest way to make sure you are on the post’s page is to click the title of it. 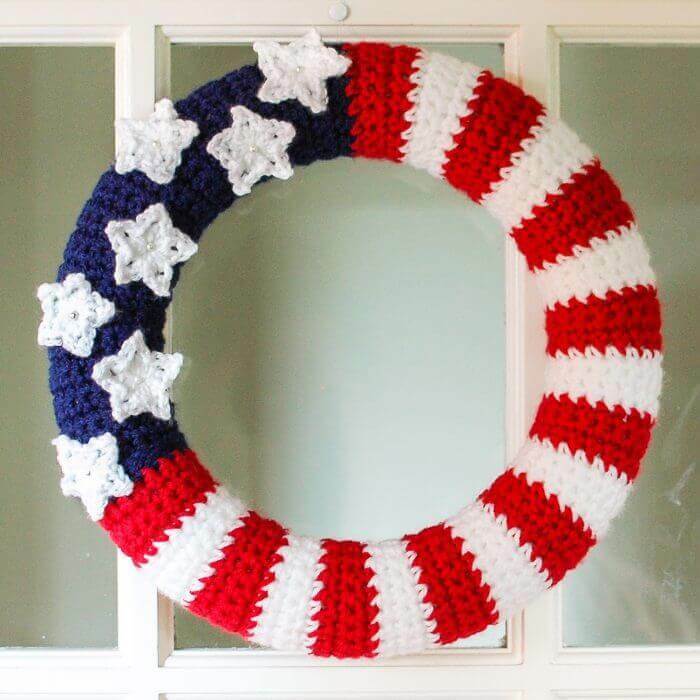 Was just pondering how to make a Fourth of July wreath last night. Had a general idea what I wanted to do, then got the email with your pattern from All Free Crochet with what I was pondering … but easier! Thank you! Such a cute idea, can’t wait to make one! Thanks for sharing! Love this !!! Thanks so much for the pattern ! What a great idea. Thanks for the pattern, Kara.